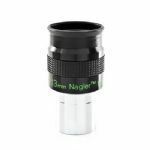 Televue 13mm Nagler Type 6 Eyepiece - 1.25"
The Televue 13mm Nagler Type 6 eyepiece is compact 7-element design which incorporates exotic glasses and coating processes to yield full field pinpoint sharpness. The Televue 13mm Nagler Type 6 has blackened lens edges, anti-reflection threads and rubber eyeguards deliver maximum contrast. Reviewed By: Matthew Stephens Yakima, Wa. Bought this eyepiece for medium power wide field viewing and boy does it deliver! Initially tested it with my 110mm Megrez and it was really nice. After waiting for the clouds to part several nights later, I test drove it with my TV Pronto. Wow! Televue products really like working together and the contrast and sharpness was breathtaking. 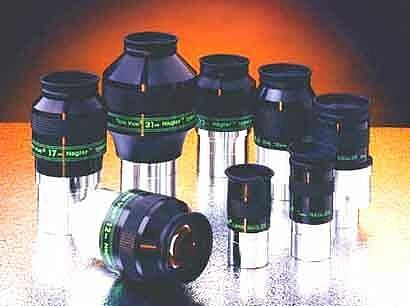 I am very happy with this 13mm eyepiece and feel the cost is justified for the performance it delivers. Clear skies! Great eyepiece, good contrast, sharpness and clarity, the views are awesome, also works great with a 2.5 powermate (Some globular clusters look great with 283x on my dobsonian. Pinpoint stars on all the FOV, velvet dark skie and the stars look like jewells. I like the 82 AFOV at 283X on the moon, feels like you are orbiting the moon. I allways get the WOW expresion on friends when I show to them the double cluster with this eyepiece on my Megrez 80mm (37X. With each new update of the Nagler design, it seems that Tele Vue continues to push the boundaries of what an ultra-wide multi-element eyepiece is capable of. The 13mm type 6 is a compact ocular that gives you a giant view of the night sky in amazing clarity. I am impressed with views of globs, galaxies and even planets through this eyepiece in my 12 dob - especially with how small in size it is. It gets docked slightly for a high sensitivity to eye placement and somewhat short eye relief, but I still highly recommend the 13mm T6 Nagler.